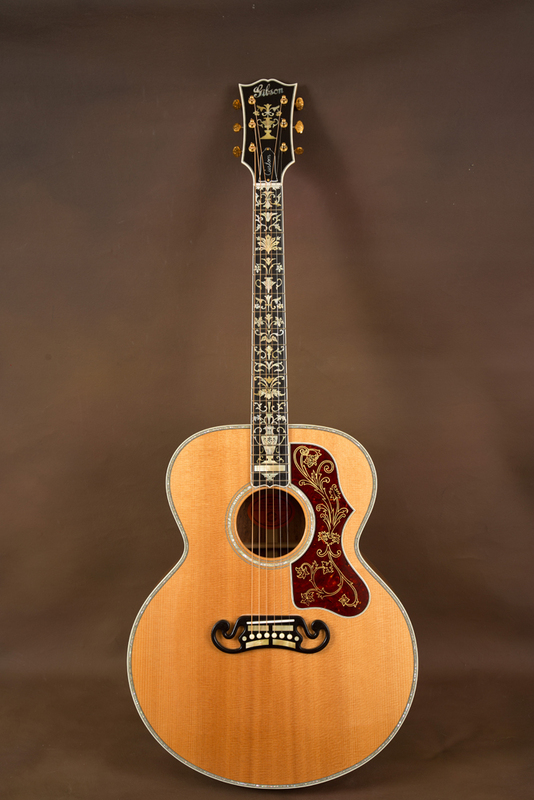 Here we have stunning a master-built Gibson J-200 acoustic guitar! 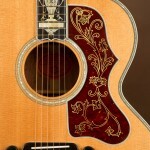 This guitar was built by Master Luthier Valerie Bolitho of the Gibson Art Shop in Bozeman Montana. 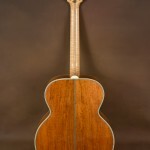 Valerie worked with Ren Ferguson as one three Master Luthiers in the Gibson Art Shop at the time this guitar was built. The guitars built in the art shop are only ever worked on by the three Master Luthiers. No production workers do any work on these guitars. This ensures that these guitars are held to a higher standard of quality. This guitar is completely one-of-a-kind. The inlays were all hand-cut by Valerie. They are very cool! This guitar really stands out among J-200's. The name “Royal” really suits this guitar. The inlays and overall theme of this guitar remind me somewhat of a Royal palace. The pickguard is also unique and was made specially for this guitar. 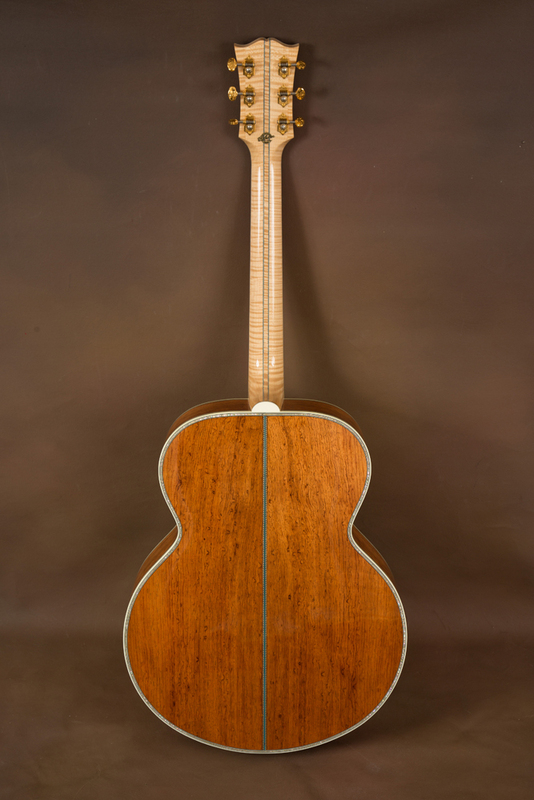 This guitar features a very unique wood on the back and sides. I can't honestly be 100% sure what kind of wood the guitar is made from, though I believe it to be Palo Escrito. The tone of this guitar is quite similar to Indian rosewood, but maybe slightly brighter. The wood is visually very unique. I've never seen another J-200 built from this wood. 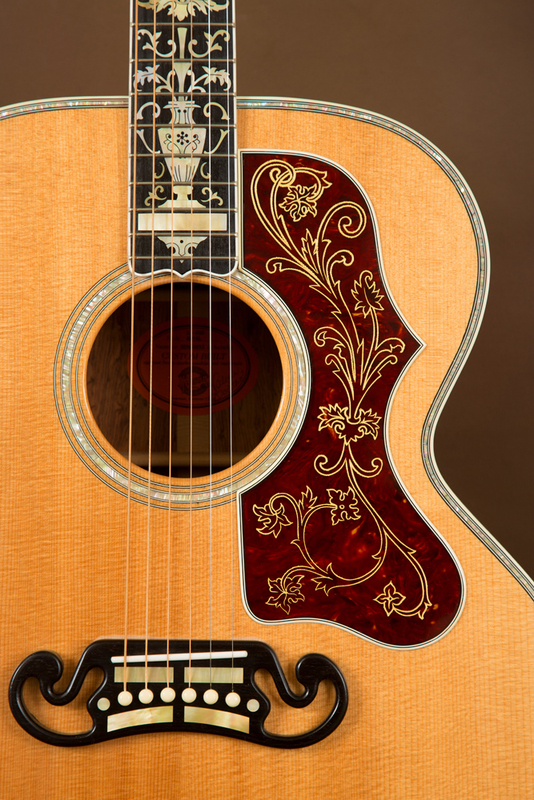 The top of the guitar is made from the highest grade of Sitka spruce. The bridge and fretboard are jet-black ebony. The neck is highly-flamed maple. The tuners are Waverly gold engraved tuners – reserved only for the highest quality guitars. The guitar features purfling on the top, back, and sides. The purfling is made from white pearl as opposed to the standard abalone. The pearl purfling matches the theme of the guitar very well and adds much to the overall appearance of the guitar. The soundhole rosette is also white pearl. This guitar is in perfect condition. It hasn't been played much at all and shows no flaws. Included with this guitar is the original hardshell case. Category: Archive. 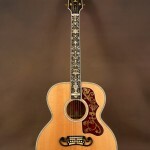 Tags: Gibson Acoustic Guitar, Gibson Custom Acoustic, Gibson Guitar, Gibson J-200, Gibson SJ-200, The Acoustic Room.